By Angury, December 31, 2018 in Book Blogs - Discuss your reading! Hola everyone. Welcome to my Reading & Writing Log for this year. As a reader I enjoy a variety of genres but you’ll find that my to-read list falls into three broad categories: Fiction, Medicine/Anthropology and Philosophy. My to-read list isn’t a list of every single book I want to read (which is several pages long) but just a list of books that are on my radar for the upcoming months. I also aim to post a review for every book I read this year. I invite you to offer your own thoughts on these novels or even suggest something new - my aim is to enter into stimulating discussions and look at the novels I read in a whole different light - your ideas are very much welcomed! I am also in the process of writing two 'novels,' more as a hobby than anything else. The Writing Log is an attempt to make me accountable and hopefully enjoy the process as well. • Berger, John - G.
• Lispector, Clarice - The Passion according to G.H. • Gupta, Mona - Is Evidence-Based Psychiatry Ethical? • Tolstoy, Leo - What is Art? ..once I've done some reading! - Poem on Eating Disorders submitted to three online magazines. - Article on Pain submitted to three online magazines. - Finished Chapter 8 of novel. Thought I'd prepare early for the new year. I can't believe it's the end of the year. It's refreshing looking back at my old logs and reading through my previous reviews. I notice I didn't write as many reviews during my 2018 log, so that's something I'm going to aim for in the new year. I'm currently reading Terry Pratchett's Moving Pictures. Every time I feel I'm getting into a reading slog I turn to Pratchett and find my love of novels returning. I wish everyone a very happy 2019 filled with joyous books! I hope 2019 will be a great reading and writing year for you ! I liked Moving Pictures, I hope you like it too . Have a great reading year in 2019, Angury. No worries, quite a lot of people read Augury instead - mainly because of Runescape. I've only read three books so far but it has been a great start to the year. Each one was different yet made me want to read more. I love, love, love Terry Pratchett - he is by far one of my favourite authors. His wit and intellect make his writing so easy to read that you forget just how much talent this man must have had to keep the Discworld series going for so long and at such a high level. Moving Pictures is start of a new series and imo on par with the Death novels. Great characterisation, cliches that don't come across as cliches (no idea how Pratchett does it) and a plot which holds your attention. Definitely planning on returning to the series again - my next Discworld book will be Feet of Clay (I'm currently on The Watch novels at the moment but was distracted by Moving Pictures instead). Arthur Kleinman is an American Psychiatrist and Medical Anthropologist. He is famous for being part of a group of people who introduced the concept of narratives and culture to medicine i.e. the idea that medicine is made up of more than diagnoses and treatment, and that people present with symptoms and perceive their illnesses based on their culture and societal beliefs. Kleinman has a unique way of writing; he is able to combine the clarity of academic style with the creative flow of narrative writing to tell a story. This book is a collection of his essays that he published throughout his career; what makes it particularly interesting is that he is able to reflect back on these essays in the context of new critiques and a changing world. Yet no matter how long ago these essays were written, I find them to be highly relevant to healthcare today. I am a big admirer of Kleinman and his work, and if I'm ever struggling in my job, I turn to his narratives and remind myself of why I do what I do. This is apparently a very popular book that I only found out about recently. I came across this novel while looking for South Asian writers and novels set in India. I noticed that a lot of my reading is very 'Western' and based in Europe. I have now found myself a new author to place on my 'Top Authors' list (it is growing far too long now..). Roy's writing is detailed and cinematic; she describes the world of India in an elaborate style while acknowledging the poverty and lifestyles that many people there still lead. The novel is focused on the caste system told through the eyes of a pair of young twins. You are already told the end of the story at the very beginning, and spend the rest of the book following the twins as they grow up and begin to realise the reality of the community of which they live in. Roy is a very good story writer; she offers you one piece of the puzzle in every chapter, encouraging you to fill in the gaps but still wanting more. For those of you who haven't heard of her, I would highly recommend this novel. And for those of you interested in such things (which I am! ), this novel also won the 1997 Man Booker Prize. It feels rather cathartic having written those three reviews - I feel like I've properly digested those books now and am ready to move on. Funny how books can do that to you. At the moment I am currently making my way through Sylvia Plath's Collection of Poems in chronological order (despite her stereotypical image I enjoy her poetry and her way of writing in general - it's very inspirational) and am about to start reading Midnight's Children by Salman Rushdie. I also have Anna Burns' Milkman on my to-read list and plan to buy Normal People by Sally Rooney once it comes out in paperback. It's refreshing to see Northern Irish writers entering the literary world (not that they weren't there before.. *cough* Seamus Heaney). I am also getting on well with my writing; I am just about to start Chapter 7 of my novel just as it starts to get interesting, and have surprisingly started writing some poetry. This was by no means planned. I basically had some pretty tiring days at work (emotionally) and let them all out on the page. It's amazing how well the words just flow out and tie together when you're not really thinking. Anyway, would love to hear everyone's thoughts on the books I've just reviewed.. or the books I'm about to read.. or on life in general! Just finished my 4th book of 2019: Midnight's Children by Salman Rushdie. The writing is good and the plot is clever - it intricates fiction with the history of India from its Independence. Although I have to admit, I felt a bit underwhelmed reading it - there was nothing that stood out to me and it felt a bit of a chore getting through the final few chapters. Perhaps it's just not a book for me. I am now just about to start reading Milkman by Anna Burns. Has anyone read it already? 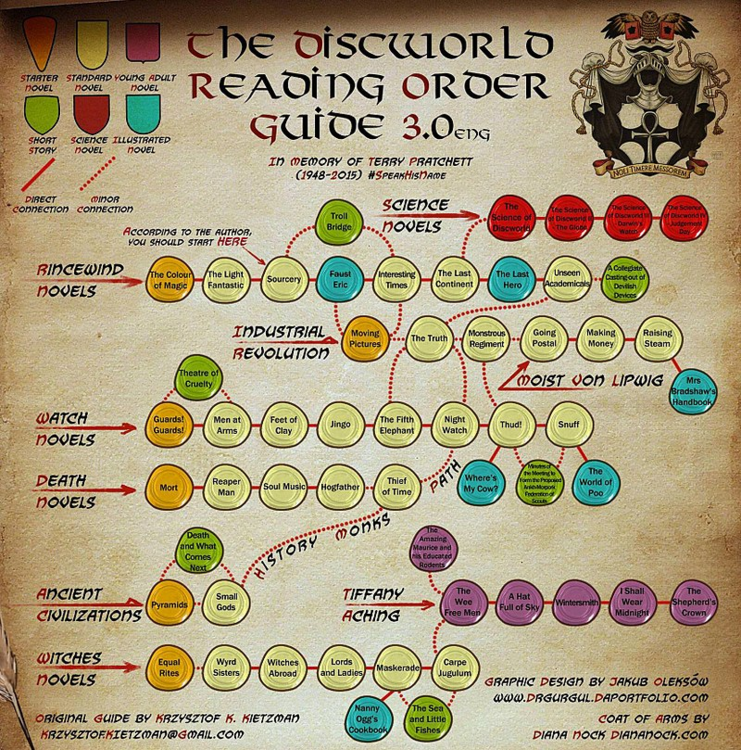 What a great map for reading the Discworld books! It's interesting to see how they connect visually like that. I was looking at Midnight's Children recently, it's a shame you found it underwhelming, it sounded really promising! Interestingly enough I was just reading the background to Rushdie's novel and why it was such a big deal when it was released. Placing the novel in its context, I now have much more respect for the novel. I think I am comparing it to novels written today and today's society rather than the writing style and society of the time. I can see why the novel won so many awards and ultimately changed writing. It introduced English-Indian Literature to the rest of the world, and for that reason alone I think it is worth reading. I finished reading Milkman by Anna Burns earlier this morning. I only picked it up two days ago and was not expecting to finish it so quickly but it is an engaging read. The novel is set during The Troubles in Northern Ireland and follows an eighteen year-old girl as she is harassed by an older, married man. The writing is informal and in some ways quite simple but it touches on deep issues of religion & politics and how easily societies can be divided. I plan to start reading Adam Bede by George Eliot today. I've only read Middlemarch by Eliot but fell in love with her writing. I've noticed a lot of Eliot fans particularly adore Adam Bede and I'm sure I'll be just the same. Milkman sounds like it's probably quite a difficult, likely very sad, book to read. Was it very emotional? I'd be interested to see how the simple, informal language works when dealing with such a large and difficult topic. I think the simplicity of the narrative voice is what makes To Kill a Mockingbird as heartbreaking as it is so I imagine it works in a similar way, although obviously not using the simplicity of childhood. I really want to read Adam Bede too so I'm looking forward to hearing what you think! Your comment actually got me thinking Hayley. As I was reading the book I didn't feel like it was a sad or difficult read. I can't say I felt many emotions at all. Thinking about it, I'm not sure if it was because of the style of writing - informal and from the perspective of someone for whom this is normal - or my own desensitisation. I think it's mainly the style of writing, which again makes it such a good book. And it's only after you made that comment that I realised, hang on! this is actually a horrific topic to write about! I think I found To Kill a Mockingbird more emotional as we were viewing the world from perspective of an innocent child whilst still holding our own understanding of the past. Whilst with Milkman I felt that I was really drawn into the plot and things like segregation and sexism were normal in this world. That's really interesting! I was looking at Milkman on Goodreads after reading your review and noticed a discussion about none of the characters having names, only descriptions ("third brother in law," for example). Do you think that might be partly why it didn't feel emotional? Do the characters feel like they have individual identities, even without names? Yes, I think that had a lot to do with it. There are some strong characters in the books and I think their identities do come through, but you don't really feel close to them. It almost feels like the people the narrator is talking about aren't really people.. like they don't matter.. which I guess is what the author was aiming towards. It's incredible how Burns was able to do all this through such simple language. I think the novel is a testament to the power of language. I've spend two months on my A&E rotation so far and it has given me a lot to reflect about. I find myself becoming more and more distant as a doctor and seeing patients in the terms they present in e.g. 'headache' 'abdominal pain' etc. I have so little time to see each patient and so many to see that in a way I think this is a defence mechanism. This ties in quite closely with the book Milkman that I just finished and our discussion above. It's interesting to have such a different perspective when you're so far away from the action. Having had these thoughts swirl around in my head for a while, I decided to write them down. Now, more than ever, I feel like I view the human body as a machine more than anything else. I never thought I would say that. Side to side and up and up, I watch the bubbles as they fall, numbers rise and fingers flash, wires stiffen and alarms go off. Here I stand with skin and blood, the pulse of man beating through the mud, liquid squirts and curtains wobble, shoes slide on floors as blue men struggle. Here I stand in the land of men, tools in hand as God repents. I would say that perhaps the only difference between Burns' detachment from the personal and your own example is that the first represents a detached perspective of the public world, while the latter is a detached perspective of the private and individual life. Interesting from a psychological point of view in both cases though. Does detachment help us to see things more clearly, with less distraction, or is it a coping mechanism in the face of complex and potentially painful issues? It could be both, I suppose. I've just finished reading Wittgenstein's Tractatus with the help of two guidebooks: A Very Short Introduction to Wittgenstein By AC Grayling and a Companion Guide written by Michael Morris. Wittgenstein was a philosopher who wrote about the philosophy of language and how it relates to reality. It's a very interesting field of study and while I had read around the subject I felt too daunted to read the original works themselves. Wittgenstein's Philosophical Investigations alongside a Companion Guide (I will be reading this next). Kuhn's Structure of Scientific Revolutions, and Poppers three works: Realism & the Aim of Science, The Logic of Scientific Discovery and Conjectures and Refutations alongside the short introduction books of science. Idealism: A History of Philosophy & Routledge Guidebook to Berkley's Three Dialogues (with the original works) alongside the short introduction series to Berkley, Heidegger, Hegel & Schopenhauer. Barthe's Lovers' Discourse & On Fine Writing, Nabaokov's Lectures on Literature alongside a Companion Guide on Derrida's Deconstruction and the short introduction series on Critical Theory, Structuralism & Post-Structuralism & Hermeneutics. What an exciting year it's going to be.. I've just finished reading both the guidebooks to Wittgensteins Tractatus & Philosophical Investigations and the original works themselves. It was far easier that I expected it to be; the guidebooks were very clearly written and I don't think I would have been able to interpret the original works without them. They also offered stimulating discussion points which I've still been pondering. What struck me most about Wittgenstein's Philosophical Investigations is not so much the content but the way he goes about arguing his point. It's a different way of thinking i.e. understanding the meaning of a word based on how it is used and the idea of language games themselves. Particularly interesting is the link (or lack thereof) between language and our representation of the world. It certainly brings a different perspective on the idea of Newspeak from 1984. I have now started reading A Very Short Introduction to Philosophy of Science by Samir Okasha before moving onto Thomas Kuhn and Karl Poppers works. This all makes me feel rather intelligent.. I decided to take a break from non-fiction and read some short novels. The first was Sum: Stories of the After Life by David Eagleman which was incredible. It is filled with 40 very quick and simple stories about what the afterlife might look like. The stories not only reflect the lateral thinking of Eagleman's mind but also make you pause about your own goals and dreams: would things really be better if you got everything you wanted? The book is a reflection of the type of stories I would love to be able to write; unique, creative and insightful. The second novel was just as good: Flowers for Algernon by Daniel Keyes. It tells the story of a man with the IQ of approx 60-70 who dreams of being smart. He undergoes a scientific experiment where his IQ progressively gets higher and higher. The novel is written via 'progress reports' which the protagonist writes himself. The writing style changes as his IQ becomes higher and higher; vocabulary, punctuation, grammar all change but so do his views on life and the people around him. It's actually a very sad novel but one that is told so beautifully. I have come across some fantastic books this year even though it's only March. My writing is also growing. I have written 8 articles in the past month, some of which I have submitted to magazines etc. I'm really enjoying myself and have got myself into a routine where I write everyday. Reading-wise, I am just about to start The Colors of Purple by Alice Walker and then possibly move on to some short stories to get some inspiration & delve into the genre a bit more. I really liked Flowers for Algernon, glad you liked it too . Good luck with your writing ! Flowers for Algernon is a wonderful book, very poignant and as you say, beautifully told. I loved it. Go To Topic Listing Book Blogs - Discuss your reading!